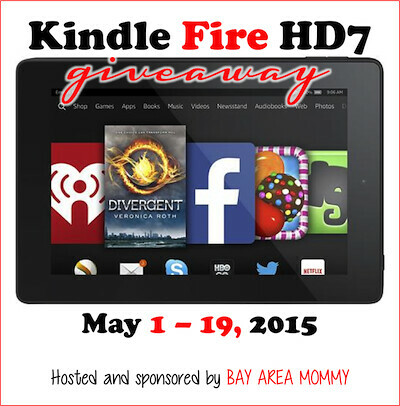 Kindle Fire HD7 #Giveaway Ends 5/19! I was not compensated for this post and will not be responsible for prize fulfillment. For questions regarding this giveaway, please contact Bay Area Mommy. Giveaway is in no way associated with Facebook, Twitter, Pinterest or any other social media site. Fast web browsing, email and calendar support including Gmail and Outlook; Edit and view Office documents. This giveaway is hosted and sponsored by Bay Area Mommy. Cohosted by Happily Ever Rushed. Giveaway is open to residents of the USA and Canada. Void where prohibited by law. Must be at least 18 years old to be eligible. Giveaway ends May 19, 2015 at 11:59pm EST. To enter, use the GiveawayTools form below. No Purchase Necessary. Good luck! My laptop was the best gift I received. My grandma gifted me a sewing machine, which I was pretty excited about! My favorite gift is probably the necklace my husband got me for mother's day last year. It has my kids' nicknames and our wedding date. My husband bought me a new car.